Hi guys, thanks for coming here. Before you read this guide, please note that I am just a private citizen and I am not affiliated or working for any of the attractions or services or tourism boards for any of the places I listed below. This guide is simply a “how-to” that recounts how we plan our holidays; it will not be able to cover all aspects of travel planning. I appreciate all the comments and feedback; however I’d like you to know that I may not be able to answer certain questions – especially those that are better directed to the theme park operators or the public transport service providers themselves, or even the tourism board. For these, I urge you to click on the links I have provided inside the guide(s) and look for the information you need in there; and if you can’t find them to contact the appropriate customer support personnel to get assistance. I try as much as possible to answer any questions that readers post in here as I know how stressful planning for a holiday can be. However, lots of these questions are repetitive and are already answered in the guide or in the comments section. So, please take the time to read the guide and comments sections first as chances are your enquiries would have been covered in there somewhere. All information and prices are correct at the time of writing. This trip was a 3D2N stay planned for a group of 4 adults (all females) and two kids aged 3 and 19 months respectively. All photos are (c) Cik Lina Bee unless otherwise stated. 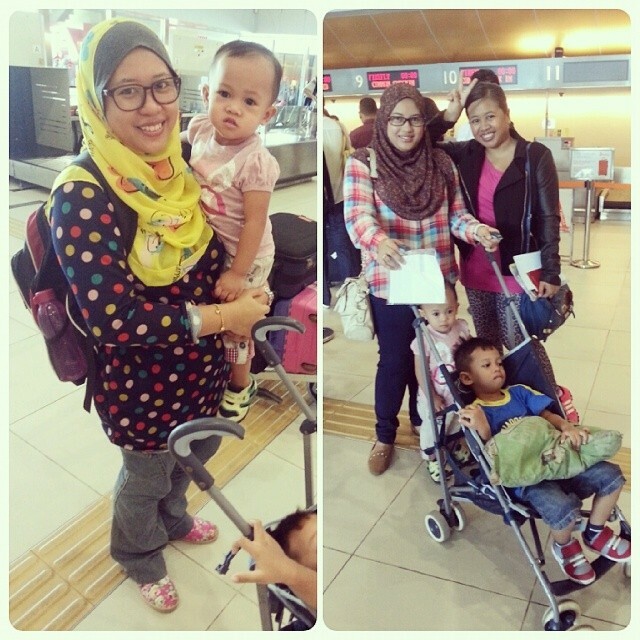 Mama Aning, Mak Usu, IA and the little monsters at Skypark Terminal, Subang. Firely (fireflyz.com.my), Malysia Airlines and AirAsia fly to Medan (Kuala Namu Airport or KNO). Check their websites to see flight times and prices. We took Firefly; tickets were on sale so we got them for RM49nett one way per person. Super cheap. Firefly flies out of Subang Airport (also known as Skypark Terminal) so it was easy and convenient; it also provodes 20kg luggage allowance so between the four of us we had possible 80kg worth of luggage that we could check-in. Medan being a shopping city, this is very important. The flight takes only about an hour. Kuala Namu Airport is about an hour from Medan city, the distance is almost similar to KLIA to KL. It is a modern and brand new airport, so it is clean, relatively easy to manouver and it has lots of shops to kill your time if you find yourself stuck at the airport. This is the fastest way to get to the city. It takes about 30 mins and you will arrive at the train station right in the middle of the city. A ticket costs Rp80,000 (approx RM22) per person. If you travel in a group of 4, you may get group discount. Ask for it at the ticketing counter (located right at the exit of the airport). Travelling by car takes about 60mins, depending on traffic. Go to the official taxi counters to get one, it will cost you approximately Rp150,000 (RM41). Make sure you get one with meters or coupon, DO NOT take any that haggles the fare with you as these are illegal cabbies. Safety first, folks. We took a Private Hire Vehicle (PHV), essentially a rented car with driver, which we booked for the entire duration of our stay including airport transfers. Since we have 2 children with us, using PHV is the best option as we don’t have to worry about flagging taxis by the roadside as we travel around Medan. After checking the price from a few service providers, we decided to go with Yoga Rent A Car (http://www.yogarentalcars.com/) as they responded quickly to all enquiries and the cost was the cheapest for an Avanza + driver + toll/fuel/parking/driver’s meals etc (an Avanza can fit 5 adults + 1 driver comfortably) . The total cost was Rp1,650,000 (RM450 or RM150/day) for a block of 12 hours, so we basically had a driver at our beck and call at all hours. The driver will wait for you at the arrival hall with your name on the placard that he holds, and it’s smooth sailing from there. The driver can also act as your tourist guide at no extra charge but we decided to hire a proper tourist guide for this purpose (see below Day 2). You can book your car from Yoga Rent A Car online. A deposit is not required; and you pay directly to the driver at the end of his service. The company will provide you with the name and phone number of the driver assigned to you. There are several buses that can take you to Medan City and other places like Danau Toba etc. Click this link to see available services: http://www.kualanamu-airport.co.id/en/guides/transportation. I have never taken the bus so cannot share with you the experience. There are many hotels to choose from that suits all budget. As always, I used www.booking.com for all my hotel needs — it is the best website for hotel bookings, I have been using it for 7 years. Check it out yourself. I chose Hotel Aryaduta Medan (which is considered a splurge by Medan Travel Guide Wiki). It costs me RM780 for two twin-share rooms for 2 nights, so that worked out to about RM200 per night. The hotel was chosen due to its location and the fact that it is adjacent to a shopping mall (Grand Palladium Mall). The Mall itself is nothing remarkable, but it provided us easy access to cafes, pharmacy and hypermarket — when you travel with kids inevitably you need to go to the pharmacy or hypermart to buy more diapers, milk, lotions and potions, snacks etc. Our room faced the pool, which looked very nice, but our tight schedule meant we were unable to use any of its facilities. There is another more upmarket mall across the street, about 5-7mins walk away, I think it is called Medan Fair Plaza, but we didn’t have time to check it out. The hotel room was okay, bit small by my standard but clean and modestly designed; the bathroom only has a shower and no bathtub, but its location is superb. As we went to Medan during fasting month, breakfast was replaced with Sahur, and they provided an elaborate-enough buffet spread for the purpose. Usually the hotels that I stay in would provide room service, typically some sort of fried rice, with fruit juice and dessert. But here, it was a proper buffet, you can even order your eggs any way you like. Service was good and efficient; my sister accidentally locked the bathroom door and maintenance came shortly after she called them; housekeeping was good too — the housekeeper even straightened out our groceries. Check in-out was painless; per usual the hotel will swipe your credit card as a deposit at the start of the stay. Here it was Rp500,000 (about RM140) and the balance of the bill was to be settled at the end of the stay. Seriously, I have no complains about this hotel at all. It is not as modern and fancy as I’d like it to be but it more than adequately did its job. One more plus point: free wifi and 100++ tv channels. We tip the bellboys Rp10,000 (RM3) as and when we need to use them. Since there were 4 of us + 2 kids, we had a lot of stuff! Tipping is not required nor mandatory. I will only share with you what we did there. If you have more days to spare, obviously you can do a lot more so feel free to check out other Medan guides for further information. We arrived at the airport around 12 noon. Pak Mada, our driver, was already waiting at the arrival hall, he could speak both English and Bahasa Indonesia so communications was not a problem. The ride to our hotel took about 1 hour. After checking in, we decided to rest for a while so that the kids could refresh and change diapers/clothes so we asked Pak Mada to come back at 3pm. The only agenda for Day 1 was to go to Pajak Ikan. Again, you must remember that we went there during fasting month so we got tired easily and had to plan our time in such as a way that we would be back at the hotel for Buka Puasa. Pajak Ikan is not for the faint-hearted. It reminds me very much of Bugis Street in Singapore, and to some extent the shopping lanes around Masjid Jamek/ Chow Kit/Jalan TAR area. Navigating through Pajak Ikan with two cranky kids was a real test of patience and endurance as we had to carry one of them at all times being that we only brought one stroller. And no, Pajak Ikan was NOT stroller-friendly. Pajak Ikan opens daily from 9am til about 5pm, so we had about an hour and a half to do our shopping. It is a maze of small, interconnected stalls criss-crossing one another selling fabric, batik, cloth, snacks, souvenirs etc. The good thing was, my group knew what we wanted to buy so we didn’t have to waste time looking for the right shop. We’d just just pop our heads in and asked if they have any Kebaya Nyonya or lycra Telekung (prayer outfit); if they say yes we’d ask to see samples, if they say no we moved on. The people are nice and friendly, and lots of friendly haggling went on. I think as a matter of principle you must always ask for a discount or cheaper price; and you should only start the haggling process if you have real intentions to buy. If not, that’s just plain rude of you. There will be a lot of hangers on who will follow you around to persuade you to buy key chains, t-shirts and other trinkets. Just politely smile and say no if you don’t want to buy anything from them. They won’t quit though so just be patient with the situation. We went to about 4-5 shops, using our judgement by the kind of items they put on display to decide whether we want to pop in or otherwise. Eventually we made our purchases at three different shops — sorry I can’t describe them to you as these shops have no names and there is no way I am able to pinpoint its exact location — lots of fabric for baju kurung and Kebaya Nyonya (for me!). The individual pieces cost between Rp100,000 (RM30) to Rp350,000 (about RM100). They are about 60-70% cheaper than what to could find in Malaysia, and the selection is much wider too. All the colours and gemstones and crocheting in the world. At the other shop we bought telekung: travel-sized ones at Rp50,000 each (RM15), colourful cotton ones called Telekung Bali, I have no idea why it is called that way, which was about Rp150,000 each (RM41) and elaborately-embroidered one that you usually see people use as hantaran kahwin (wedding gifts) at Rp280,000 (RM77). CONSIDERABLY CHEAPER than what these would cost in Malaysia. All of them come with individual bags so they make nice gifts for people back home. Lastly we went to a batik shop (actually we went there the next day) where we bought an assortment of cheap and expensive kain batik and pelekat. Prices start from Rp25,000 to Rp250,000 (RM7-RM70) per piece. My sister also bought 2 tailor-made batik shirts for her husband and our father, I can’t remember how much but I think it was about RM80 each. As they were handmade, they looked very nice. All in all, it was a good spree. Now, 2 hours is not enough to spend in Pajak Ikan. We basically managed to cover just a short distance within one lane; ynot even 1/10 of what Pajak Ikan has to offer. We had wanted to buka puasa at a famous padang restaurant called Garuda, but decided to go back to our hotel and risk it at the cafe called City, which is essentially an ice cream parlour, in Grand Palladium Mall instead. 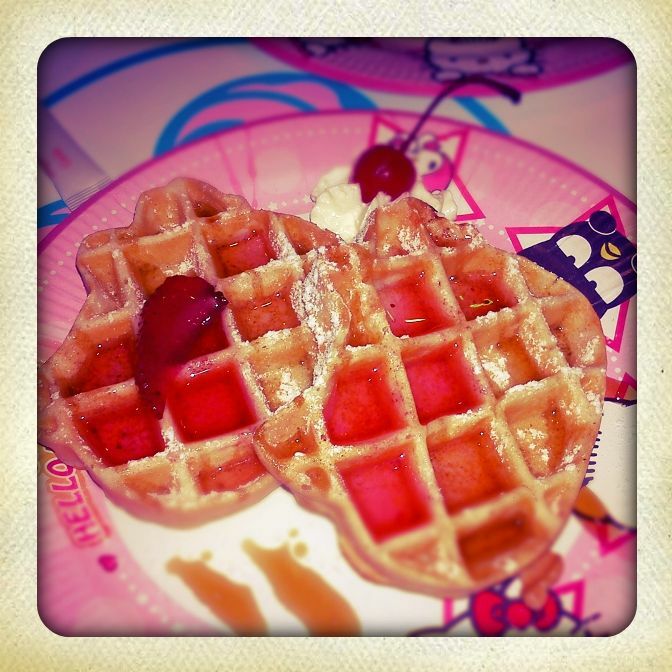 Nice food but not memorable; but the kids love love love the waffle cakes so that was a plus. Later that night we decided to roam Grand Palladium Mall; and then go to the hypermarket to buy groceries. My sisters discovered that Hada Labo (the Japanese skincare range) was sold at almost 50% cheaper that they are in Malaysia so they spent a lot of time in the pharmacy browsing for it. They bought some daywear for the kids and blouses and dresses for themselves. Yes, cheaper than Malaysia too, or else they would not have bought them. Day 2 started at 1030am. I had arranged for a private tour guide to assist us during this portion of the holiday. 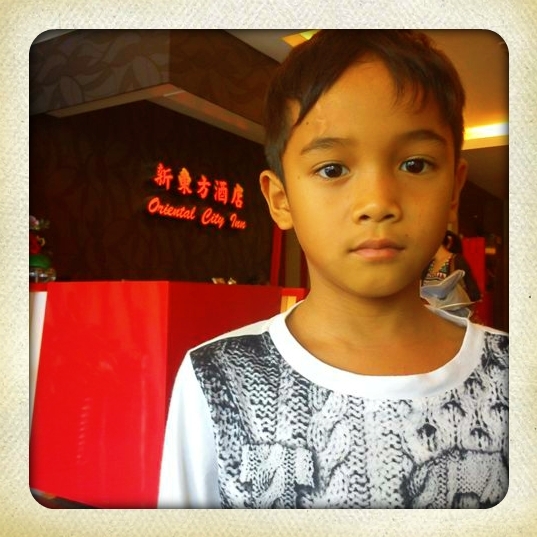 His name is Fauzi, you can get in touch with him here http://bit.ly/TYzDeM. He is very nice and knowledgeable, a half-day Medan City Tour cost Rp350,000 not inclusive of meals and entrance fees (about RM100). I highly recommend him, you can also arrange your transportation with him if you’d like. In our case, since we have hired a private car, Fauzi simply came to the hotel and hopped in. You can read detailed tours about these places elsewhere. But personally for me the visit to Tjong A Fie mansion is a must; the story behind it fascinated me so much and the architecture is amazing. You must see it to believe it. 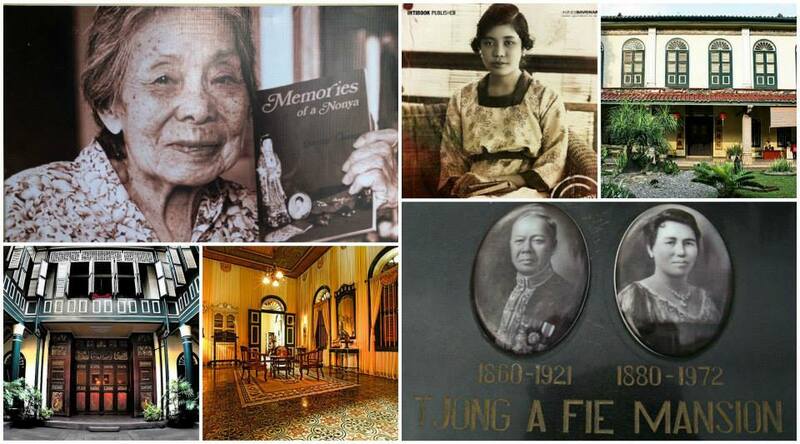 I regret not buying a copy of Memories of a Nyonya by Queeny Chang, Tjong A Fie’s daughter while I was there. I intend to buy a copy of it online later or check out Kinokuniya in KLCC to see if they carry it. 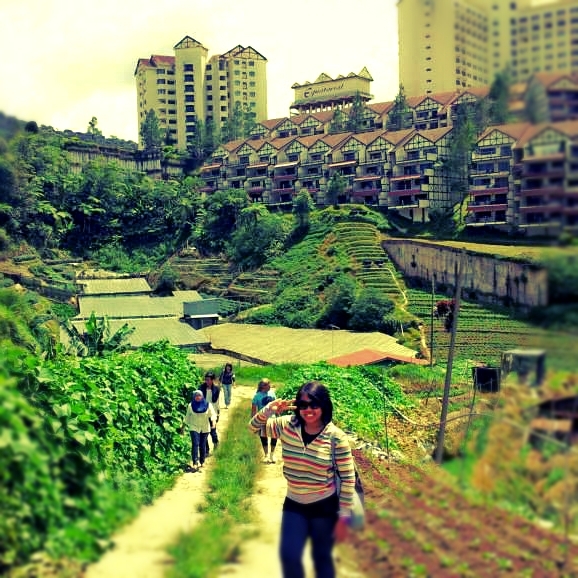 For other tour options, you can browse here: Medan Holidays. Again, you must remember that we travel with little kids, so while we originally intended to go shop at Centrepoint (the latest shopping mall in Medan) after the tour was over, we decided to skip this and went to Jalan Majapahit instead to buy some Medan goodies to bring home. Fauzi and Pak Mada took us to Zulaikha, apparently one of the best baker of the local delicacy known as Bika Ambon — which is essentially honeycomb cake made with tapioca flour and comes in a variety of flavours like original, pandan, banana, durian, cheese and chocolate. While there, we also picked up some Lapis Legit (spiced layer cake) and cheese brownies; the sisters also bought some pisang salai with cheese (cured, banana slices which are fried in batter and then smothered with grated cheese — it’s an acquired taste) and passionfruit juices. The price for Bika Ambon and other types of cakes starts at Rp80,000 per box (RM22), while pisang salai goes for Rp20,000 per packet (RM6). 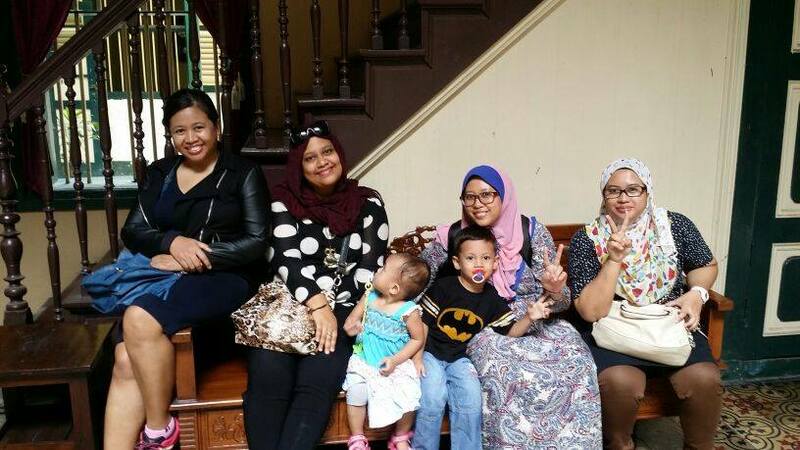 We went back to the hotel to rest and refresh and went out again at 4pm (this was when we went to Pajak Ikan again to buy the kain pelekat and batik). We had intended to buka puasa at Restoran Tip Top, one of the landmark restaurants in Medan made famous by its handmade ice cream. But Pak Mada convinced us to go to Garuda (the restaurant that we wanted to go to the day before) and since all of us love nasi padang/minang food, we readily agreed. 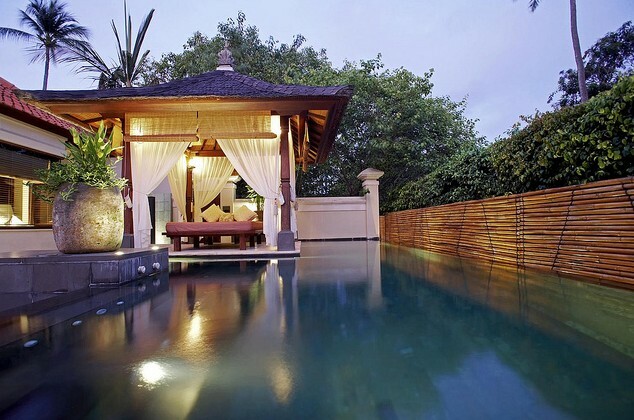 Buka puasa set us back about Rp571,000 (RM160) or about RM40 per person. Well worth it. Go try. At Tjong A Fie Mansion. Our flight was at 12pm so we didn’t have much time to spare. After checking out at 8am, we went to the airport and walked around to shop (we reached there at 9am, fed the kids, then checked-in at 10am; which left us with about 1 hour to kill before we have to board). There are some decent brands like Swatch, Cotton On, Kipling; the usual suspects are also there like Starbucks, Rotiboy, A&W, Dunkin’ Donuts, bookstores etc so you won’t be bored. Lots of money changers there too, so if you need to exchange some money for airport tax ie Rp200,00/pac (RM55), go there before you check in. Souvenirs here are a lot more expensive than Pajak Ikan, obviously. All in all, I spent about RM1,000 for the trip to Medan (including flight tix, hotel, food, car + driver and shopping). It is a very affordable shopping city for those who like quick getaways. You can include little treats like going to the spa, hanging out in speciality coffee shops (I hear Otten Coffee is good), go to theme parks or eco-parks or go to out-of-city locations like Berastagi and Danau Toba if you have the time. I will be going to Medan quite frequently for work, but I don’t know if I will go again to shop. It is a charming little city; but personally for me my shopping city of choice is still Singapore. It is a very nice trip though, I enjoyed it and so did the rest in my group. I owe you Super Easy Guides to Gold Coast, Langkawi, Singapore and Cameron Highland. Soon darlings, soon. Back in September, we promised Amin that we would take him to Legoland if he gets good results in his Year One final exams. Much to our shock (yes, shock), Amin was named one of the 5 best students in his year. 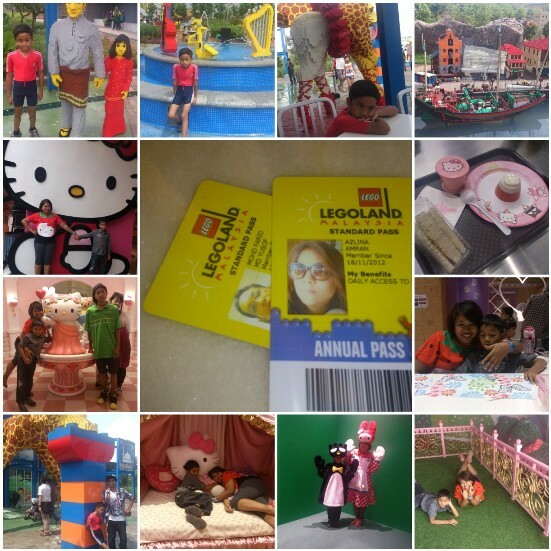 So after the prize-giving ceremony 3 weeks ago, we planned for a trip to Legoland, and since Hello Kitty Town was recently opened, we added it into our itinerary. The queue to purchase tickets outside the theme park can be unbelievably long. If you have your e-ticket ready, you can skip this step altogether. Trust me, the scorching sun at Legoland will make you wish you had. 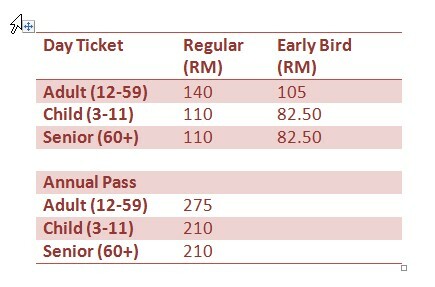 Ticket prices are as follows. We always buy from the official websites, not through agents or affiliate websites, as we find the prices are best when you buy directly from the source. Affiliate websites always charge RM3-12 extra as service fee. *Early bird refers to online purchase of at least 7 days in advance. There are discounts and packages offered from time to time so check the website often. All prices and details are correct at the time of publishing of this post; prices are in Ringgit Malaysia (RM/MYR). Print the e-tickets and bring them with you for fast admission. If you don’t have a printer handy, save the pdf file on your phone and redeem the ticket at the Ticketing Counter right outside the admission gates. *It is a standard price for all ages here. MyKad refers to the national identity card issued for all Malaysian citizens. Non-citizens will pay the Without MyKad price. Another point to note, there is another indoor theme park above Hello Kitty Town called The Little Big Club. We did not go here as it is suitable for younger children as it features Barney and Friends, Bob the Builder, Angelina Ballerina etc. You can purchase a 2-in-1 pass for both theme parks for a discounted price. Go to the website for details. We purchased Annual Pass for Legoland and day tickets for Hello Kitty Town. Firely (fireflyz.com.my) and AirAsia (airasia.com.my) fly to Johor Bahru (Senai Airport). Check both websites to see flight times and prices. We took AirAsia; the flight times were not ideal but it was the best for our purpose. Flight prices range between RM200-RM400 (one way). We landed very early at Senai Airport and went to the food court to have breakfast before hitting the road. This is where your travel plans will get tricky. Legoland and Hello Kitty Town, though only 5km apart, are situated in newly developed township. There are public transport available but I am not going to write about that in detail because we rented a car. The areas are linked by highways so having a car is best. There are several car rental agencies at the airport. If, like us, you are taking the first flight in the morning, these agencies will still be closed (they open at 10am). So, you either kill some time til 10am, or you can take the business cards from the counter, get into a taxi and call them once you reach your hotel (that was what we did). We rented an automatic Proton Wira for 3 days at RM130 a day + RM18 daily insurance + RM400 deposit; we pumped RM30 worth of gas when we returned it. I don’t have the business card with me but I will print the number here once I do. The agency charged us an additional RM25 to deliver the car to our hotel; we returned the car back to the agency at the airport. Go to Bus Online Ticket to look at bus schedule and prices, it ranges from RM31-45, you can take the bus either from Kuala Lumpur (Pudu Sentral) or from KLIA and LCCT. The buses will arrive at Larkin Bus Terminal in Johor Bahru (JB). From here, you can either rent a car, take a taxi or take a bus to your hotel. If you want to go to your hotel first, your best bet is to take a taxi. If you can, find the official taxi ticketing counter and buy a coupon from there. It’ll be pricier than metered fare but it is safer (p/s the fare does not include additional charges like toll, parking, boot space etc). By bus: see the details, prices and departure times here. I suggest you go to Legoland first, and then take a taxi from Mall of Medini (mall is connected to Legoland) to Hello Kitty Town – it is much easier that way. As far as I know, there is no connecting buses between Legoland and Hello Kitty Town yet. If you live in KL or SG, I think the easiest way is to drive. We brought our GPS navigator along so the drive was a cinch. For driving directions, see here for Legoland; and here for Hello Kitty Town. Amin at the reception of Oriental City Inn, Skudai, Johor Bahru. We stayed at a small budget hotel called Oriental City Inn in Taman Jaya, Skudai (near Skudai Parade), which is about 23km from Legoland and 10km from Senai Airport; we took a family room which consisted of two double beds and ensuite bathroom via agoda.com. There are many budget, regular and luxury hotels along the way and there are several towns to choose from, all are within 20-30km away from Legoland/Hello Kitty Town. If you are a city rat, choose Johor Bahru as your city. Towns like Danga Bay (closest to Legoland/Hello Kitty Town), Skudai or Senai are a little off city-centre so prices are cheaper but it will be harder to get public transportation from these small towns. A full-service budget hotels offers all-in-price, meaning all amenities comes with the price. You may need to ask them for daily change of towels, but basically it behaves like regular hotels – the difference is the amenities are basic and the room is usually small without any frills and decor. Most hotels in Malaysia provide free wifi either in the room or at public spaces like the lobby, so don’t worry about internet access. We prefer to stay at budget hotels when our itinerary consist of being outside most of the time. For city weekend getaways, where we stay indoors and use the hotel facilities like pool, gym and games room as much as possible, we will opt for a more luxurious and high-end ones. A pick-and-mix budget hotel like Tune Hotel has variable prices, depending on the amenities that you choose and when you book – the earlier you book, the cheaper the price. So, you will pay the basic room price (varies depending on type of room, date of booking etc) and then you add on the additionals (these are fixed prices) like air-conditioning, TV, towels etc. Now you would think that Tune Hotel is the best bet for super budget travelers as you can opt to just buy the basic room? Wrong. Make an informed decision by comparing prices before you buy. The hotel that we stayed in costs only RM80/night for a standard room and we didn’t have to bother about daily purchase of air-conditioning, towels, soaps, wifi, TV etc. For me, this is easiest. The family room at Oriental City Inn sleeps 4 person (two double beds). We purchased additional toilettries (shampoo, body wash, toothpaste) at the sundry shop nearby coz the ones provided by hotel was inadequate but this is normal for any of the hotels that we stayed in – when you have 4 people in a room those shower gel in tiny bottles just won’t cut it . The hotel is small but clean and adequate; shops and food stalls are peppered around it so food and amenities were not a problem at any time of day or night. Room comes with free wifi, ensuite bathroom, closet, TV, coffee-making facilities, and free daily soap + bottled water. You need to leave key at reception if you want housekeeping to clean your room. Can ask for extra towels or change of towels on a daily basis at no additional charge. Legoland is about 30mins away from this hotel; and it is about 15mins from airport. There is no mini fridge, but the sundry shop next door sells ice that you can buy for RM1 a packet so this was more than enough to quench our desire for iced sodas. There are plastic cups in the room but no dinner plates so if you have a hankering for late night snacks you either go to the stalls in front of the hotel or buy cup noodles from the sundry shop (just pour hot water and you are done!). I usually use Cuti.com.my, Agoda.com or Booking.com for all my hotel needs. A lightweight raincoat or umbrella (it can get very, extremely hot or very extremely wet from one minute to another). I need to talk a little more about this. Unlike Universal Studios, there’s no covered walkway in Legoland. They have trees, but these are young and newly planted and do not provide any shade at all. So, wear whatever you need to wear to keep cool – umbrellas, sunglasses, hats etc. If it rains and you do not have an umbrella or raincoat handy, all the shops stock plastic raincoats at RM15 each. Wet wipes – with so many people around, you never know what you will accidentally touch, or people can spill things on you etc this. What happens if it rains? The ticket is valid only for the day of purchase and just like any other theme parks, it is a rain-or-shine place. You will not get a refund or anything if it rains; and if you do not go on the stipulated date, the ticket will expire. You can go in and out of the park at all times, the park attendant will stamp your hand with invisible ink. I see lots of people heading out for lunch at Mall of Medini, which is connected to Legoland, instead of eating at the cafes inside. You can enter again anytime as long as you have the stamp. In case it gets wiped or anything, keep your admission tickets handy for inspection. Do I have to pay for the rides in Legoland? No. But, you may need to pay additional fee for some game stalls where you can shoot basketball or hit a monster and win soft toys, just like in funfairs. These kind of stalls are clearly marked, so if you do not want to pay for these games, you don’t get to play them. Some rides will involve water, so you may want to bring change of clothing. We had Amin changed into his swimming gear as soon as we come in and instructed him to do all the water rides first so that we could get this out of the way. We changed him back into his day clothes after that. Can I bring my bag when I go on the rides? You will be asked to leave your bags before you take the ride. This is normal. There is a paid locker room near the entrance (RM10 for 3 hours, RM20 for whole day). We deposited our bags here so that we can travel light. Is there free wifi throughout the park? I don’t know because I was on mobile data plan, but my guess is no. There was also no place to recharge your laptop/mobile phones batteries. Is there a surau for prayers for Muslim patrons? Yes there are 2 prayer rooms inside Legoland; one is near the entrance and another in the Imagination section. Is there Halal restaurants? Yes, all of them are Halal. If you want to eat something else, just get your hand stamped, exit the park and eat at Mall of Medini. It is connected to Legoland near its Parking Lot 3, and is about 5mins walk under a covered walkway. Is it disabled-friendly? Yes but not very comprehensive. If you need further assistance, just check-in at the Guest Service counter near the main entrance. You can also rent baby/kid strollers here. Sorry I don’t know the prices. Can I bring my own food? Okay this is a tricky one. Technically no, but I see a lot of people do. We didn’t bring our own and ate inside the Park. Are the roller coaster rides scary? All roller coaster rides are scary – some are scarier than others. Legoland is designed for kids between the ages of 8-12 so the rides are not that scary, in my opinion. There are rules and height requirements to ride these, so please check the notice board at the entrance of each ride first. Like I said, some rides involve water so you will need a change of clothing. There are dryer machines that you can use, I think it costs RM5 per entry, in case you don’t have any extra clothes and need to dry off. Can I finish Legoland in a day? Yes. Annual pass is best if you have kids who would like to go there during school holidays. Mama Azlina’s husband is from Johor and she has some business there so the Annual Pass makes more sense to use. We went to Legoland twice as the first day was so hot we were exhausted after a couple of hours and spent most of the time hiding in the cafes. The second day was cloudy and a little rainy, so we finished the rest of the sightseeing and rides then. But if you can soldier on, 1 day is more than enough to cover everything. I would like to reiterate about the heat. Legoland can get very very hot, I touched the top of my head and my hand burned like I was touching a hot iron. It rained heavily on and off on the first day but the pavement was dry within minutes – that was how hot it was. 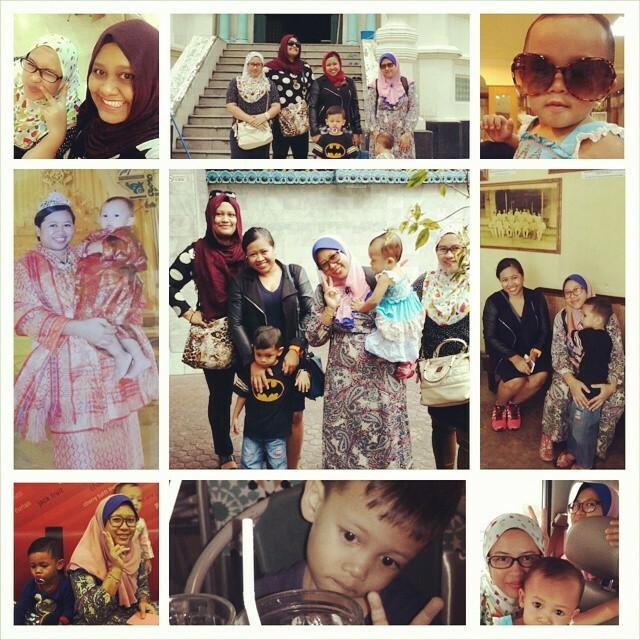 I developed a terrible migraine as a result and did not enjoy the trip – but the kids and Mama Azlina loved it. For this reason, I am not recommending families with very young children or very old people go to there. Kids between the ages of 4-12 are best; any younger they will definitely get cranky and irritable by the heat. Older kids and pre-teens may find the attractions a little too junior, but the rides are suitable for all so they won’t be bored. THE BEGINNING: Waving flags and two towers mark the entrance area to LEGOLAND® Malaysia. Shops, locker room, prayer room, ATM, stroller rental and smoking section are all located here. It is the first section you will pass as you enter the park. LEGO CITY: Aircraft and boats are waiting for your command here at the airport and harbour. This is the first section to the right of The Beginning. The rest of this guide will follow the map counterclockwise starting from Lego City. Driving school and Legoland Express (train) are located here. The open-air theatre called Lego City Stage is also here, check park schedule to know show times. The acoustics in here is terrible, so try to get in early so that you can get a seat and the best view/sound that you can get. We were standing at the back and could not make heads or tails out of it, all I heard was bleh bleh bleh. LAND OF ADVENTURE: This area of the park is hidden in the jungle, surrounded by wild animals and fantastic creatures. The Dino Island raft ride is here, expect to get wet. IMAGINATION: The place to be for all those who are fascinated by research and experimentation. This is for the more “brainy” kids. Lego Studios where the 4D movies are played are located here, there are 3 different movies a day and each one takes about 20 minutes. It is the best place to escape the heat. LEGO KINGDOMS: A suspension bridge takes you inside the giant castle, the trademark of LEGO® KINGDOMS. The waiting time here was excruciatingly long, The Dragon roller coaster ride is partly indoors and outdoors so it is quite fun. This is the longest/tallest roller coaster in the park; if you can do this, the rest of the rides are a piece of cake. LEGO TECHNIC: In LEGO® TECHNIC everything is faster, bigger and even more action-packed. Lego Academy and Aquazone are located here so expect more wet stuff. The sections are laid out in circular fashion. There’s lot of photo opportunities all over the park, everything is made from Legos. Later that afternoon I had a tomato and cheese sandwich in Ciabatta (RM13.90) and a small cappucino (RM8.90). 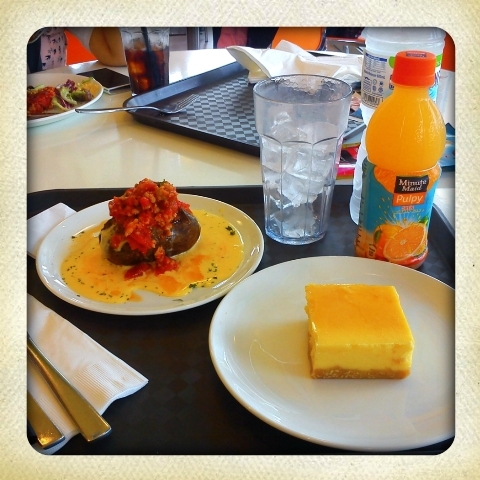 All were good, I was satisfied with the food I had in here and the prices are not far off the prices in regular cafes. Souvenirs on the other hand, are expensive. In fact I feel that the souvenirs in Universal Studios are cheaper. A key chain can set you back RM19.90 each and fridge magnets go for RM39.90 for a set of 4. Lego blocks can be bought by the kilo (I don’t know the price) or by the set; we bought two of the smallest sets and both cost RM79.90 each. Caps are at RM49.90 each, t-shirts RM89.90. Mama Azlina was eyeing the chess set but was put off by the RM245.00 price tag. Even a basic stationery set costs RM49.90 so I told Amin to forget it. 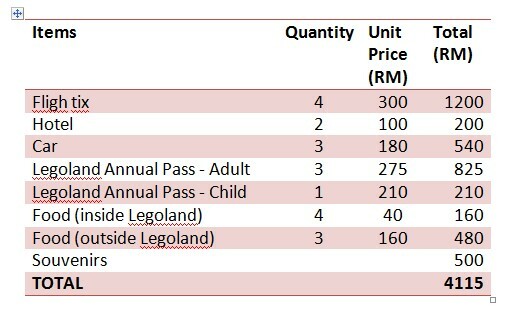 In total, the budget breakdown for Legoland (just estimates, these are not the exact amount) is as follows for a family of 3 adults and 1 kid (a 7yo). Amar is 14yo – which by the way, is considered an adult. Hello Kitty Town is located in Puteri Harbour, about 5km away from Legoland. For directions, see the top of this guide. It is one of the 3-in-one indoor theme parks; the other two being Lat’s Place (under construction) which is not really a theme park but a theme cafe, and Little Big Club. You can purchase tickets to individual theme parks for RM50|RM65 each or RM85|RM110 for both parks. We only took the one for Hello Kitty Town. You will be given a Daily Activity Card together with your admission ticket. What happens if it rains? HKT is an indoor theme park that occupies the entire 2nd floor of the building. You don’t have to worry about rain. Do I have to pay for the rides in HKT? There are no rides. All the attractions are either DIY or games-based. It is more like a see-and-touch trip. Is there free wifi in HKT? I don’t know because I was on mobile data plan, but my guess is no. There was also no place to recharge your laptop/mobile phones batteries. Is there a surau for prayers for Muslim patrons? HKT is part of a large building that is still under construction. We finished our tour in 3 hours so we didn’t have any need to use the surau. I think the facility is not ready yet but it will be provided as part of the building once everything is ready. Is there Halal restaurants? The Red Bow cafe is Halal, it is inside the building and at the entrance near the ticketing counter. Is it disabled-friendly? Yes. There is a elevator to go between floors and everything is on the same level so it is easy for the disabled. Can I bring my own food? No. But you don’t need to. We ate there because we wanted to, not because we were hungry. Can I finish HKT in a day? Yes, you can finish it within 2-3 hours. Hello Kitty Cookie Studio (collectively all these are located in what is known as “Wishful Studio” but it has different doors and queues for the various activities): you are given a plain butter cookie to paint, once done you get to eat it or take it home. Only 16 people are allowed at a time. Hello Kitty Nail Salon: the boys will roll their eyes at this one. They will give you nail stickers and nail colors for a DIY nail painting session. You can spend as much time here as you want and wait for your nails to dry. Hello Kittty Jewelry Making Studio: you will be given a plain silver neckchain and get to choose one (1) charm from the range of charms in the room. Hello Kitty Dress Up and Costume Studio: Adults and kids costume are available here. They dress you up in these costumes and then take a pic of you against a green screen, where various Hello Kitty background scene will be added post-production. Taking the pics are free, but you need to pay to get the prints. We paid RM140 for a total of 6 prints, each comes with a cardboard frame and the soft copy can be downloaded from its website within a month. Hello Kitty House: Cuteness overload! This is what it says – the house for Hello Kitty. You can take photos everywhere. Black Wonder: This is a simple “treasure-hunt” maze. You are given a lantern containing a black light. As you enter, you need to place the Black Lantern in its place under the touch screen computer – a series of questions will appear and you need to answer these correctly. Clues are all over the place. Once done, a logo will appear. This will be the same logo that you need to find inside the maze, there will be 5 additional sections inside the maze and when you solve the puzzle at each section, you will uncover one alphabet that will form your password. When you finish collecting all 5 alphabets, head to the exit and type in the password. If you are correct you will get a certificate of completion. It is not THAT complicated but the instructions can be confusing. Just ask the park attendants if you are stumped and they will help you. Our password was KITTY; but it can be any of the 5 passwords depending on what logo (or “black symbol”) you are assigned to. Hello Kitty Doll Factory: they have closed down this section and move it into the gift shop. Basically you need to buy a doll (RM89) and then put in stuffing, dress it etc. The doll comes with a gift certificate (see pic at the top of this post). 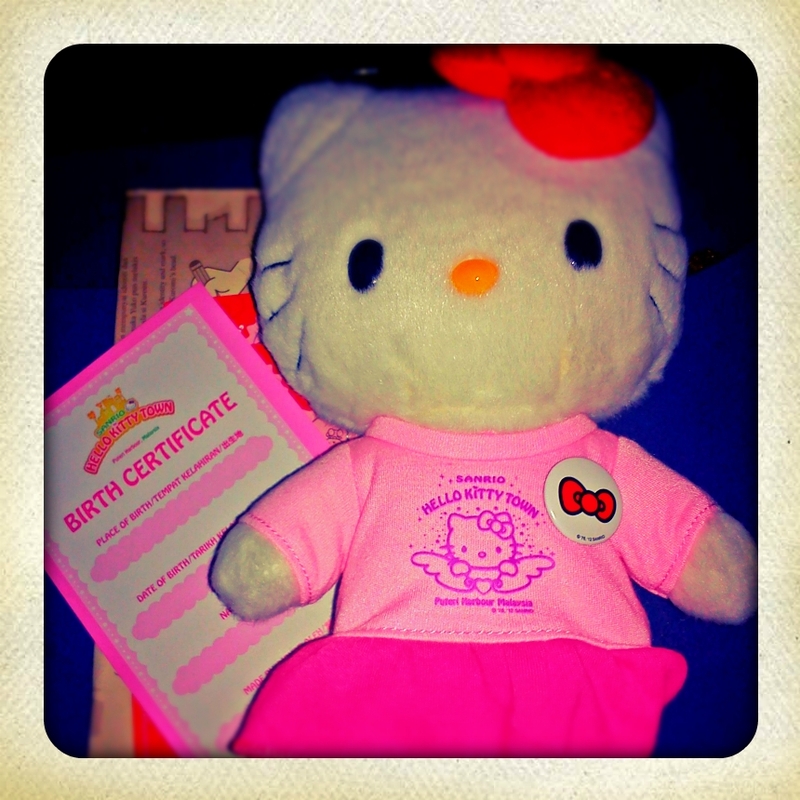 This one is a limited edition mini Hello Kitty Doll that was produced for the opening, only 2,000 pcs are available. In time, there will be a more comprehensive doll making facilities and accessories but at the moment this is the only doll available. You can only enter each studio ONCE. So make sure you don’t rush it and spend as much time as you need taking pics or touching, holding, kissing things within the park. Hello Kitty and Dear Daniel comes out from time to time for photo op, the first session is at 11am. There is also a cute tea cup ride near the entrance, make sure you turn the handle to make the cup goes round and round. You can go on this ride as many times as you like. There is also a playground but this is for the younger kids. As mentioned earlier, the Red Bow Cafes are located at the entrance and within the park. The food is mostly snacks : there were pudding, waffles, sandwiches, chicken sausages and the usual drinks on the menu, nothing too filling. Prices range from RM8-RM20. They were not bad but but not great either; but the presentation was too cute to resist. You will pass the gift shop in order to exit the park. We only bought the Hello Kitty Doll and a set of fridge magnets. Prices are similar to Hello Kitty stuff that you buy from Toycity or Toys’r Us. They have some adult stuff here too like phone cases, handbags, wallets, pens, wristwatches and neckties – everything was under RM200 but there was nothing special. To me it was just another day at the toystore. 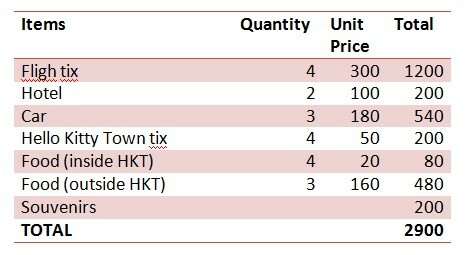 In total, the budget breakdown for Hello Kitty Town (just estimates, these are not the exact amount) is as follows. Please note that I made individual budgets for Legoland and Hello Kitty town so that you know what to expect if you want to do only one of them. If you want to do both, obviously some of the costs are duplicates (like flight tix, hotel, car and daily food). 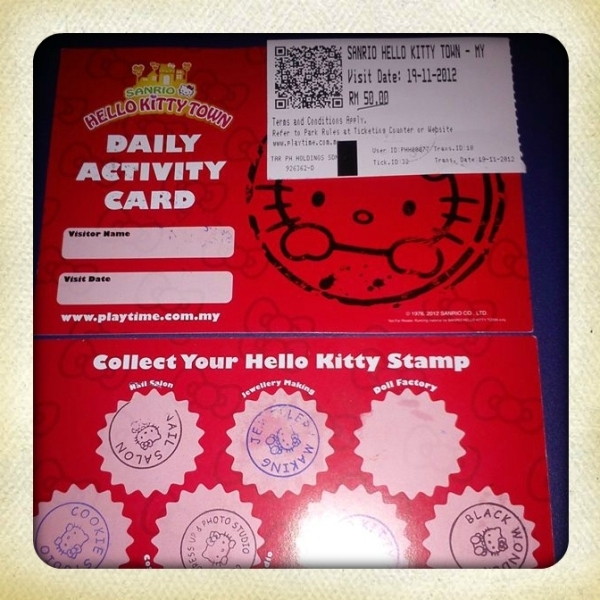 A simple way to look at it is this – if you want to go to Legoland and then have some time to kill at Hello Kitty Town, add another RM10o per person to cover your day there. That said, I enjoyed my time at Hello Kitty town more than Legoland, mainly due to the heat. When my migraine hits, I get really grumpy. The two are not exactly comparable, by the way. 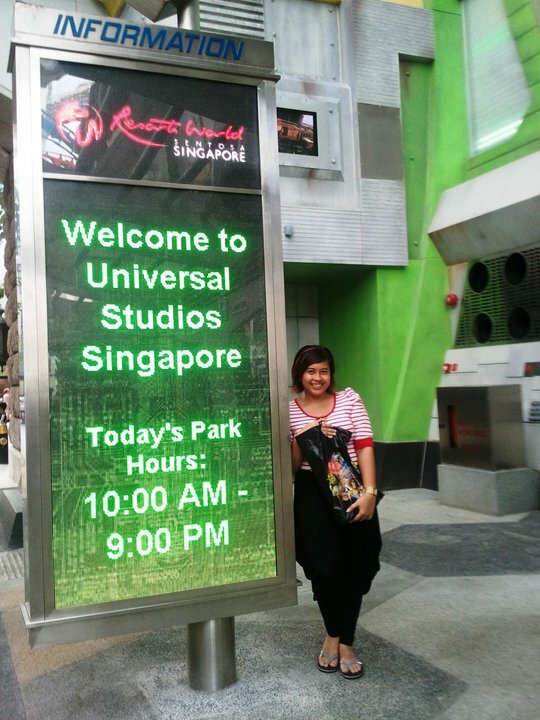 Mama Azlina and family will definitely visit Legoland again, but I’m gonna pass as I prefer Universal Studios. I don’t mind going to Hello Kitty Town again once Lat’s Place is opened but unless they have more covered walkways in Legoland, it’ll be difficult to persuade me to give it another try. Anyway, hope this guide helps and let me know what you think of the two places! We were told that Johor Premium Outlet (JPO) is near Legoland. No it is not. It is closer to the airport than it is to Legoland. For directions by car and also by bus, go here. Basically you either drive there, or you go to Larkin Bus Terminal and take the bus. If you are driving and have not downloaded the latest map for your GPS, it might be tricky to get here because it will not recognise the address. The best option is to enter the co-ordinates: GPS 1°36’11″N , 103°37’17″E . JPO has its own exit/access road, chances are if your GPS is not updated it will direct you to the small Kulaijaya town and make a U-turn to enter JPO’s main road. Keep your eyes open as you can skip this process and enter JPO directly from the highway. What is JPO? It is an outlet mall. All the brands here are sold at outlet prices, which can be anywhere from 10-70% cheaper than at regular stores. The off-season products will be very cheap, the in-season ones will have small discounts. Like other outlet malls, the more you buy, the more discounts you will get (but this differs from store to store). At the Adidas outlet for example, if you purchase 2 items you get 10% discount, if you purchase 3 items you get 20% and 4 items and above will give you a 30% discount. 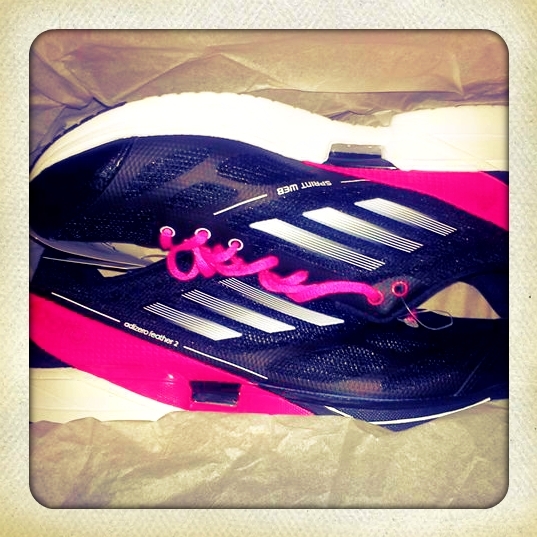 As my birthday present, mama Azlina bought me an Adidas Adizero Feather 2 w in black with pink laces which retails at RM350-399 at ebay or in regular stores. It costs RM280 here and since Mama Azlina bought lots of stuff from the store, we got an additional 30% discount, so the final tally for this pair was only RM196. Some products are more expensive than the Adidas Factory Outlet in Summit USJ. But to be fair, the items in the outlet store are current, while the ones in the factory outlet are past seasons or clearance stock. You can get list of stores and other information on JPO here. It has a food court and many cafes including Starbucks and Coffee Bean so you can spend half a day here, no problem. I have 9 draft posts waiting to be completed. But that’s blogging for you – some days you write write write; other days you don’t write at all. 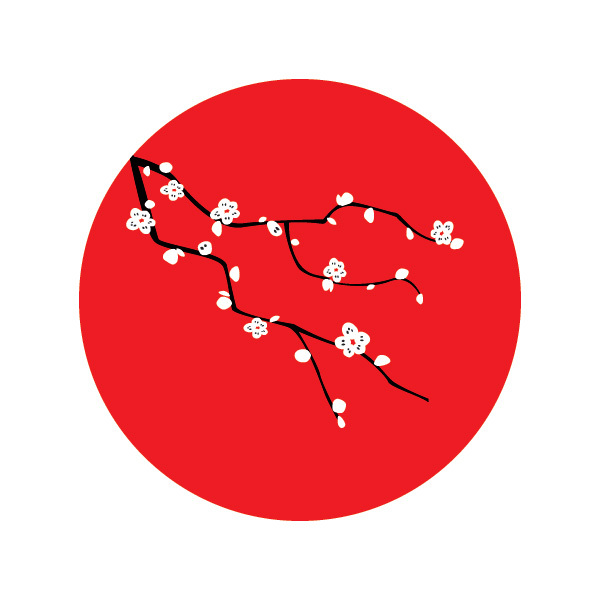 Anyway, I am heading to Tokyo in end January 2013 for a short rest & relax trip. If you can help me around, meet up for a cup of coffee or ocha, or just want to say hello and give me some tips on moving about in Tokyo, that’d be great. Post your thoughts and tips in the comment box below; alternatively you can hit me on twitter at twitter.com/ijahamran or drop me an email at ijahamran@yahoo.com so that I can add you in my facebook. I may not have enough time to go to a concert at Tokyo Dome, but who knows ya? Fingers crossed. Originally written on June 14, 2009; updated today. 1. 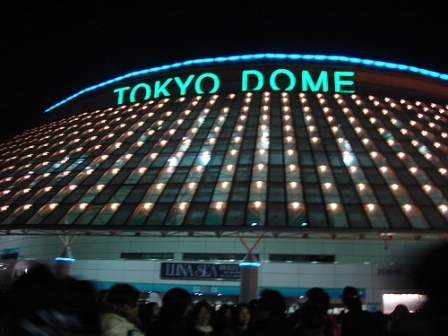 Catch a concert at the Tokyo Dome, Japan. Whatever concert. I just want to be in the place. I’ve watched so many concert DVDs filmed at the Dome it’s a flaming shame if I don’t get to experience it at least once. 2. Go to E for All (Entertainment for All Expo) in LA, the sort-of successor to the previously open-for-all E3, take lots of pictures with as many Booth Babes (yes, it’s a noun) as I could humanly manage and make all the fanboys weep with envy. 3. 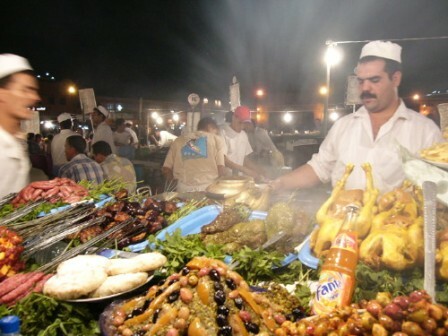 Blow a month’s worth of salary eating at Djemaa El-Fna, Marrakech. Yes, food occupies a very large portion of my brain. 4. 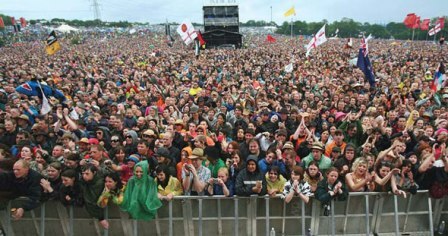 Spend a totally hedonistic, self-gratifying (not in a perverse kind on way so take your mind out of the gutter), pleasure-seeking weekend at the Glastonbury Festival. 5. 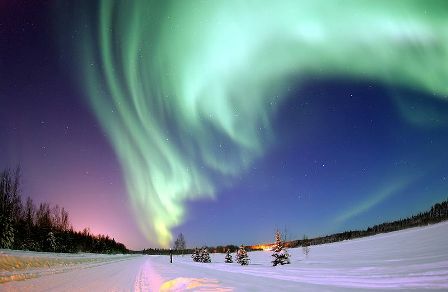 Stay up quietly til dawn to watch an Aurora Borealis over the skies of Alaska. I’m cool with Canada too. 6. 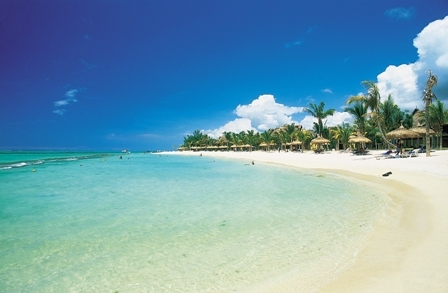 Swim in the impossibly blue waters of Mauritius without caring about how fat I look in a bikini. DO NOT use your imagination. 7. 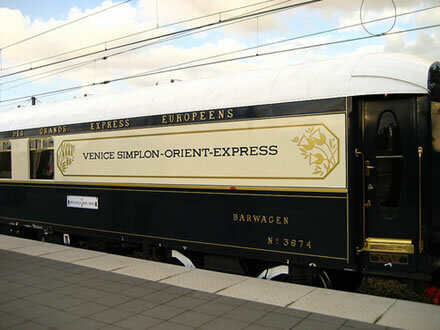 Explore and discover Europe aboard the opulent and luxurious Orient Express. Sneaking off to the train’s roof to have afternoon tea is optional. I will be broke for the next 5 years after this trip but I will deal with that when it happens. Live in the moment, yes? 8. Put on my spectacles, look intelligent and hobnob with people who make a living out of writing at the Ubud Writers and Readers Festival in Bali. Then, watch the sunset at Nusa Dua with a cup of local coffee and a few slices of sponge cake (I cannot decide how many slices are too many). 9. 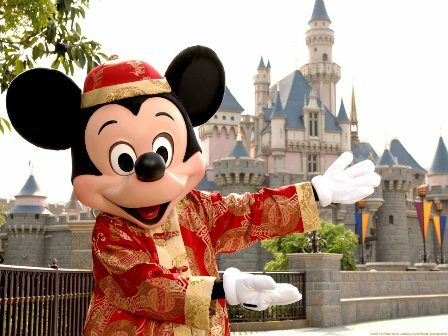 Appease the wild and (sometimes) out-of-control-if-not-paid-attention-to shopping beast in me in Hong Kong, then trick Snow White at Disneyland HK to speak to me in Chinese to confuse the children. …and 10) I can’t decide on a 10. Suggest any? Thanks Ibu Wita for suggesting the 10th destination. 10. 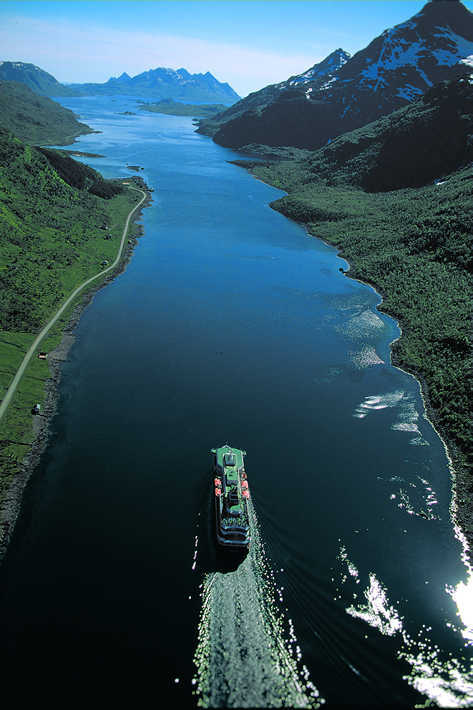 Take one of the passengers ships from ‘Hurtigruten’ and sail amongst the fjords, almost to the Russian waters and experience the midnight sun. Geek squad alert, get your giant robots on! Important details below, for full press release click the source at Seibertron right here. Sale of TRANSFORMERS collectibles, latest line of TRANSFORMERS toys and products which will be available for purchase during the convention. Reservation hotline +65 6577 8888. 2012 TRANSFORMERS Cybertron Con, http://www.cybertroncon.com.